Dana Lynn Louis’s La Grande Robe marks a shift for Front of House, the first in an upcoming series of installations by woman artists, and with this change an interesting shift in focus. Dana has an explicit social component to her work, but the connection between this agenda of validation and the current installation is more nuanced than at first glance. The scale of the dresses is overtly heroic, but invites the viewer to slow down and observe the details of its rice sack fabric and coat-of-many-colors stitching. I was struck by the contrast between the weightlessness of the dresses swaying elegantly, and the bold typeface on the sacks announcing over and over “Poids Net, 50 KG.” Between the flaring, ball gown shape of them, and the thought of the village women carrying that much weight, even for a short distance. Between the quiet dignity of the pair of figures standing erect in space, and the continuous, purposeful activity of the women shown in video projected onto a white expanse of the larger Robe. There were two moments of deeper illumination for me in living with Dana’s installation over the last few days. The first was in the afternoon, when the sun wheels its way into the gallery and strikes the dresses, transforming the massive, almost geological objects into incandescent lanterns. A fairly straightforward moment of beauty that I recommend to all visitors. The second was a moment in the video Dana shot while staying in Sinthian, showing a woman gathering ground nuts into a rice sack, its pattern blending uncannily into the fabric of the dress itself. This forced on me how much the dresses were metaphorically as well as literally a screen upon which the culture of this Senegalese village was projected. The intensively worked seams, the bright colors of the fabric and joyful flare of the shape all speak to the great spirit of the women behind these dresses, who work in carrying on a living culture is honored here. Thank you Jessica Helgerson for giving me the opportunity to premier La Grande Robe in your lovely space and for seeing the importance of its exhibition. And to the Team at JHD: Adam Porterfield, Stephen Pierce, Mariah Hum and Mira Eng-Goetz for your invaluable assistance. With muchgratitude to myvideo editor Scott Ray Becker and the installation crew: Bill Boese and Todd McMurray. To the Women of Sinthian“On Jarama, du Courage”! Without you the world would not spin in the same way. Thank you to Amadou Sow for working so patiently with me to make the robes and to the co directors of Thread: Nick Murphy and Moussa Sene for helping make the connections and my projects at Thread successful. And to Abdulai Kante, the village chief and the entire village of Sinthian for extending their hearts to those of us who are lucky to be in your presence. Lastly to Nicholas Fox Weber and The Josef and Anni Albers foundation for having the brilliant dream to create Thread, I am forever thankful. Dana Lynn Louis is a visual artist who makes works that honor the interconnectedness of being and explore the timeless, magical reality of biology in the natural, personal, and constructed worlds we inhabit. Glass, light, drawing, shadow and a variety of other media shape her work, which fluctuates between intimate, domestic-scale pieces, interdisciplinary performance collaborations, and large scale public installations. Relative to our tenuous political and environmental climates worldwide Louis began to seek commissions and projects that would allow her to imbue spaces with beauty and hope, and open a window into a world of calm contemplation. From intimate objects and drawings to all encompassing environments, Louis creates visual worlds that help us perceive the beauty, levity, and wonder that exist in the natural world and in our own bodies and minds. Louis brings a social component to her work based on her teaching of yoga and her experiences traveling through West Africa and helping to create Ko-Falen, a cultural center in Bamako, Mali. At the Oregon State Hospital, she incorporated her teaching practice into workshops involving writing yoga meditation and beading, which resulted in permanent works for a new hospital. 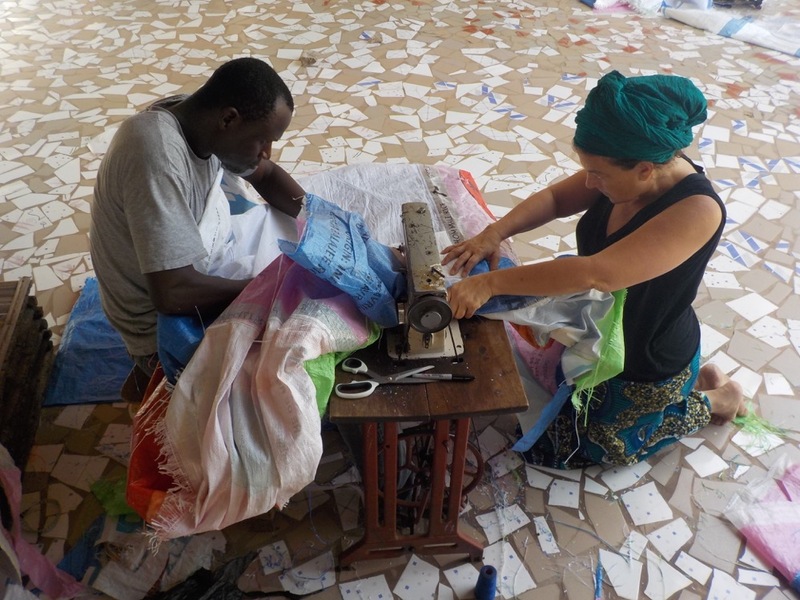 In January 2017, Louis returned from a residency in the remote village of Sinthian in Senegal, West Africa where she introduced yoga and drawing classes and collaborated closely with villagers on her work La Grande Robe. Louis’ work has been exhibited and collected Internationally. Articles about her work have appeared in such periodicals as Sculpture Magazine, Artweek and the German magazine Glashaus. Lewis and Clark College also published a book on Louis’ work aligned with a major solo exhibition entitled “Clearing” in 2014. Louis has received awards from The Pollack Krasner Foundation, the Regional Arts and Culture Council, the Ford Family Foundation, and the Oregon Arts Commission. Her Artist in residency Awards include: The Museum of Glass in Tacoma Washington, Bullseye Glass Factory, Ohio State University, Oregon College of Art and Craft, Sitka Center for Art and Ecology, and THREAD a project of the Josef and Anni Albers Foundation in Senegal, West Africa. Louis has a BA from the University of Wisconsin, Madison in Art and Education, and an MFA from the Ohio State University. She lives in Portland, Oregon. Louis is represented by Russo Lee Gallery in Portland Oregon and Friesen Gallery in Sun Valley Idaho. This project is dedicated to the women of Sinthian, Senegal where I created this work while in an artist residency at Thread, a project of the Josef and Anni Albers Foundation. Given this incredibly challenging time on our planet politically and environmentally, I feel the potential of extending our hearts and minds on the ground. I firmly believe that making the type of connections such as those possible at Thread is one way in which we can attempt to heal the social and environmental destructive forces of today. 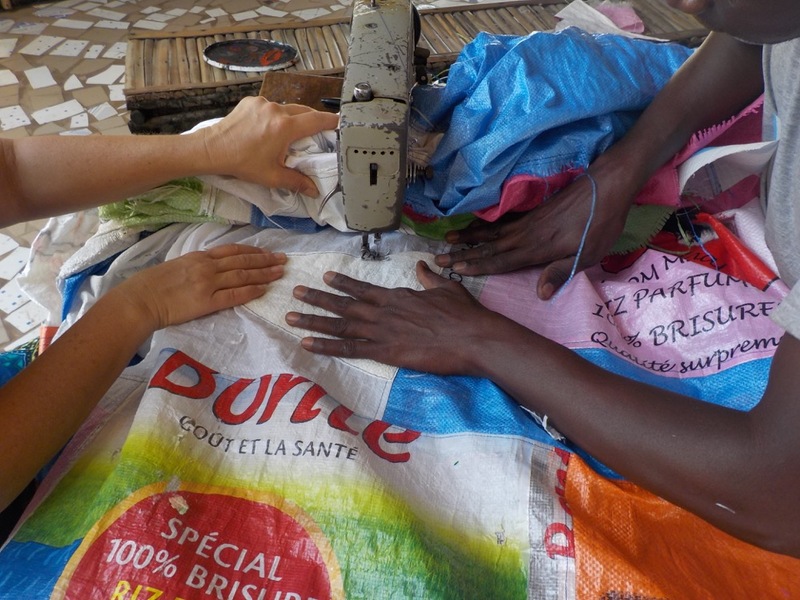 I began La Grand Robe imagining that I would make something out of rice sacks. 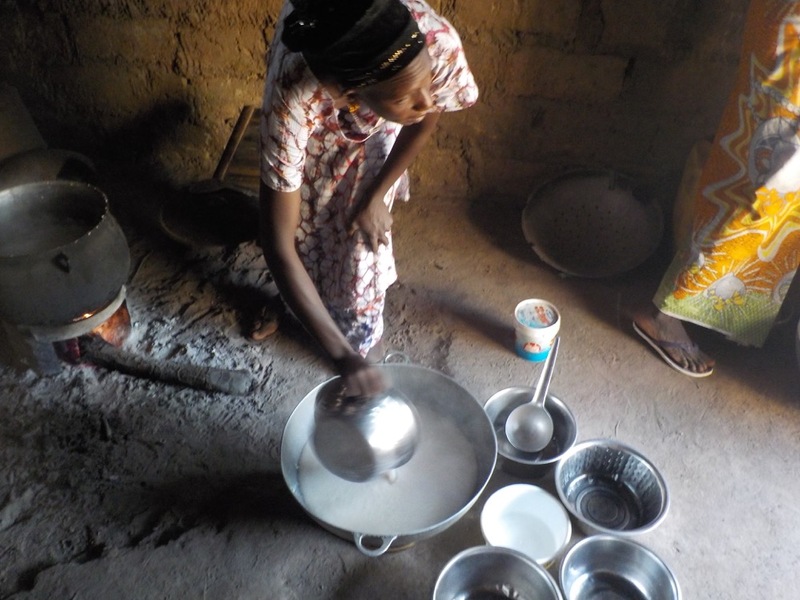 Having spent much time in West Africa over the last 15 years, it is clear to me that rice is largely the sustenance of the continent, requires an inordinate amount of work and careful attention and I wanted to express this. After spending several weeks in the village of Sinthian I realized that the focus of one project would be the women there. There are many ways with which I could have “taken” images and stories to create new work, yet I wanted the project to go deeper and trusted that, with patience, more would be available to me and to the village residents. I embedded myself in the community, learning from them and teaching yoga and drawing, among other things. The women there are a force and exude strength, tenacity, perseverance and creativity with a constant joie de vivre imbuing all of their activities. From watering gardens at the crack of dawn to firing ceramic pots into the night, they are unflappable and energetically buoy the village with their smiles and amazing style. This is all done as they care for and participate in family and village life. Dress is important, and they always elegantly display their finest.